We miss things. Perhaps is little misconceptions that we hear but don’t make it to our brain because we’re too busy taking roll and pointing out where to pick up missing work for the umpteenth time. We (ok, I) need to figure out a way to slow things down, so we can better listen, think, and respond appropriately. That’s incredibly challenging to do ad hoc. Some of us, either through hard work and reps or a divine gift bestowed by R’hllor, have a knack for being able to do just that on the fly. The rest of us have a ways to go. Also, it’s really difficult to ensure that all kids are speaking. Even in classrooms where the teacher knows better than to call on the quick hand-raisers, we do it anyway, because it keeps things moving. The use of protocols in a classroom can be a way to facilitate better and more equitably. For one, they can give kids equal voice. Too, the give us time to process and develop a better response than an on-the-spot, seat-of-your-pants teaching moment. Here are a four protocols I like to utilize in classrooms. The Know/Need-to-Know process. This was/is my go-to means of kicking off a problem. Students identify what they know about the problem and what they need to know (either content-instruction related or additional-info-needed related). I’ve blogged at length about this one, and others have made it even better. Notice and Wonder. Max has written about this before on his blog and in his book (no, seriously, why haven’t you bought this yet?). This is great for data explorations and interesting visuals and diagrams. See also: See/Think/Wonder. Notice and wonder allows access for all students to describe what they’re seeing and generating authentic wonders. Gallery walks. Once students have solved a problem, they post them around the room and students circumnavigate to each solution for a prescribed period of time (say, 5 minutes). While observing solutions, students are asked to make comments and ask additional questions via post-it note or some other asynchronous medium. Be sure to require at least one comment and at least one question per student per gallery walk “exhibit.” We want everyone’s voices here. I like / I wonder / Next Steps. Another feedback protocol, the sentence starters are exceptionally helpful for students. Five minutes of “I like…”s, another five of “I wonder…”s, and five for “Next Steps” if there are things to potentially do after the feedback. There are also a bunch of great protocols from, say, NSRF that can be used to facilitate discourse on non-content oriented stuff. I’ve used the final word protocol such that students can demystify, clarify, and expand upon a text. The block party protocol is great to do with students and adults when you want to get them talking about a text or selected parts of a text. Stick to the protocol. You’re going to seem like an overbearing ogre at first, but among the chief value of protocols is giving equity to student voice. The moment the protocol is abandoned you are paving the way back in an inequitable discussion. Use a protocol iteratively. The power of protocols comes with repeated use. Once students have mastered the protocol itself, it’s incredible how rich the content-oriented discussions can become. I’d say use a particular protocol no less than three times a month. A small while back a teacher described the use of protocols as “scaffolding for adults.” The context was in staff collaboration, but I think it works well for classroom instruction too. In an ideal world, kids would be quick to voice ideas and we’d be just as quick to answer them in a way that produces sense-making. Until then, we can use protocols to help us get there. What are some of your favorite in-class protocols? I’m really good at enjoying the cleverness of a scenario and grafting (sometimes seamlessly, sometimes less so) it onto a mathematical standard (or two or three). I’m less good at starting with a standard (or two) and designing a scenario that appropriately and precisely maps onto it. Sometimes that results in a problem that doesn’t – in a targeted way – address the standard I’m hoping students will take away from it. Sometimes I wind up developing four problems that require students to develop a polynomial expression using the same idea without really introducing anything new or extending it. We do a lot of standards mapping and curriculum mapping, but rarely do we do question mapping. For example, I’ve facilitated and messaged this problem followed by these problems. The scaffolding and teaching (I hope!) will address different standards. But the problems themselves don’t necessarily necessitate different methods or manipulation of polynomials or quadratics. The crux of Problem-Based Learning is to elicit the right question from students that you, the teacher, are equipped to answer. This requires the teacher posing just the right problem to elicit just the right question that points to the right standard. The Experience of a Student in a PrBL Classroom. In order to achieve this dance, there might be subtle differences in the way a problem is posed. Consider this an attempt to get better at that backwards design approach and to ensure that we’re eliciting the right question. A design path of a task in a PrBL Classroom. 1. Start with the standard. Hey, here are some standards! 2a. What is the question that you want students to ask that points to the standard? 2b. What might be the language and vocabulary in which students ask it? 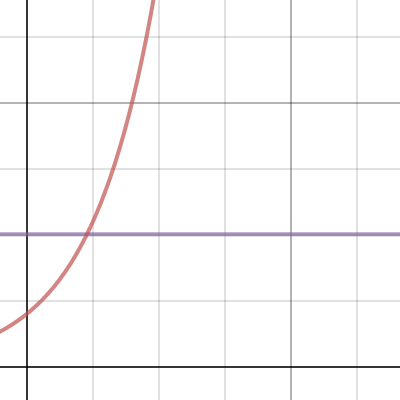 Because students probably won’t ask “how do we find the roots of a polynomial?”, but they might ask “how do we find where the curve crosses the x-axis?”. 3. What is a possible scenario or task that will elicit that question? [Optional?] Check your work: Are there other standards that this scenario might address? Are there other ways to solve it that skate around the standard you’re aiming at? Maybe consider giving it a trial run by posing it to a colleague and see if they get close to your intended question? OK so let’s try this. I’ll pick a standard. How about this one. How do I find the inverse of this here equation that has an exponent (or logarithm) in it? Perhaps something along the lines of y=ab×. 2b. What might be the language and vocabulary in which students ask it? How do I find the solution of this here equation that has an exponent in it? 3. What is a possible scenario that will elicit that question? Me thinking: Well there are lots of applications of things with exponential growth and decay. Populations, investments, radiation and half-life. Perhaps a solicitation letter asking students to analyze bacterial growth of a certain strain? I’d also suggest that the practice of Question Mapping might actually help in facilitation as well? Namely that you have a question in the back of your pocket that you know you need to get the students to ask. And if they’re not asking it you need to pull it out of them with leading questions or other bread crumbs. For the problem draft above, I’m not moving on until we establish the questions in 2a and 2b as the impetus for the lesson. It might be fun (and enlightening) to have a curriculum map of questions along with your standards. And shoot, you’d have your semester review already written months in advance.